We’re on the hunt for the best RC trucks in the world! We checked out some of the highest-rated RC trucks we could find, researching and reviewing each one until we built up a list of ten of our favorites. So if you are looking for the sweetest RC trucks around, we’ve got them right here! There were a couple of important stats we looked into while compiling this list. 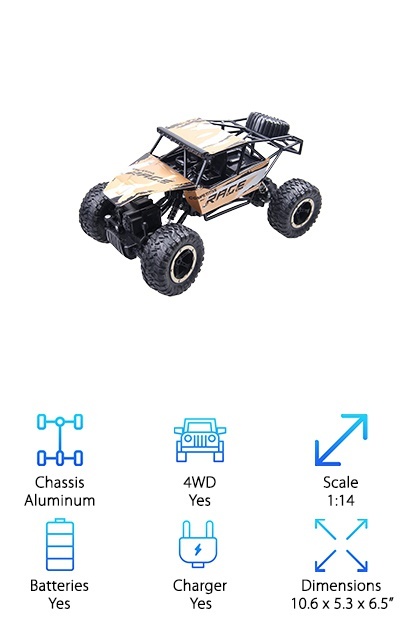 Here is each of them with a breakdown of what each one means when you’re shopping for an RC truck. Chassis - A chassis is the framework on which a wheeled vehicle is built. While most full-sized cars are built on steel frames, RC trucks are usually built on plastic or aluminum. 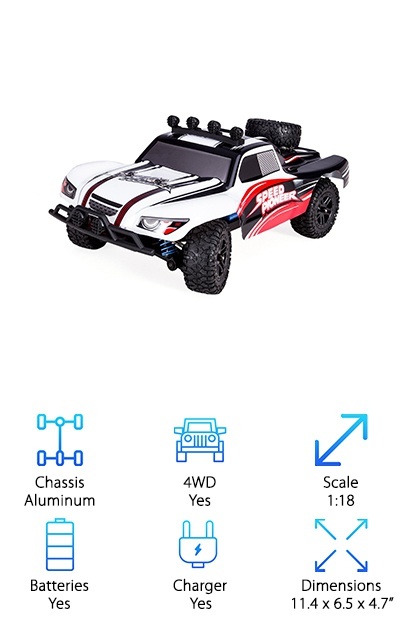 4WD - Want to go off road with your new RC truck? Four wheel drive allows you to get over some difficult terrain, If you want it on your new truck, check out this icon to see if you’ll get it. Scale - The ratio of scale is always a one, then the number of times the full version is bigger. This will be based on the dimensions of the small car in relation to the larger version. 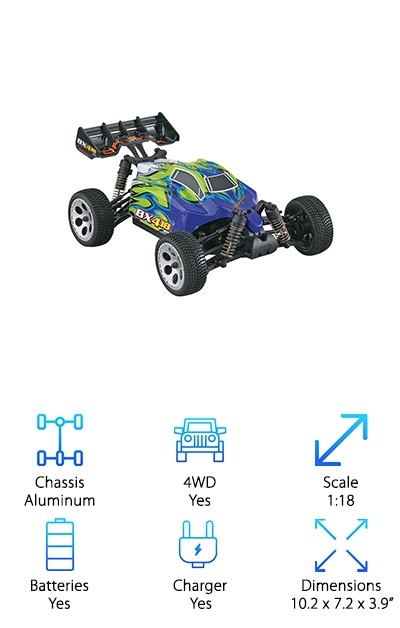 Batteries - Does this RC car take batteries? We’ll let you know what kind of batteries you’ll need in the description. If the vehicle is not rechargeable, you’ll see a “yes” in this box. Charger - If the RC truck is rechargeable, we’ll put the “yes” under this icon. That means no batteries are needed, and the RC truck comes with a rechargeable battery. 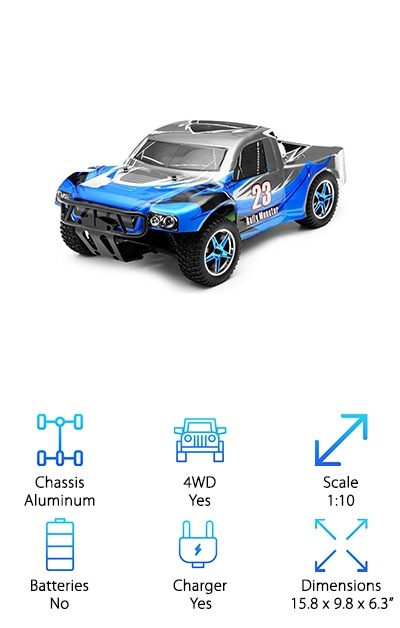 Dimensions - How big is the RC truck? We’ll let you know the dimensions of the truck in inches. Each measurement will be formatted with length by width by height. Now that we’ve learned a little more about that important stats for an RC truck, we’re ready for the reviews! We picked all ten of these trucks because they were something very special. They stood out, were highly rated, and they really stood up against the competition. However, there were two that really pulled ahead of the pack. The first place is where our Top Pick is; this truck was our favorite overall and was the perfect truck in our minds. The second place goes to our Budget Pick, which is the best truck we could find that didn’t cost a lot of money. While all of the trucks are awesome, these two were the best; if you’re in a hurry, you can just check out the two of them. Now, let’s get to those reviews! Want the best brushless RC truck around? Our top pick is the Exceed Monster Truck. This aggressive, off road truck is ready for almost anything you can throw at it. Its 4WD setup is just as good at off-roading as it is on the road! It has beautiful, chrome-plated wheels. The Exceed Monster Truck is powered by a 3300Kv brushless motor. This thing is built to be durable and can take some bumps and hits without missing a beat. It has real front and rear bumpers designed to protect. The camber and toe turnbuckles are adjustable as well as the shocks and spring preload. But the best part? The driveshaft, shock towers, upper deck, and more are made from a sturdy aluminum to help protect the motor from damage when you’re taking it off road! Looking for a sweet budget model without giving up on any of the fun? The ToyPark Off-Road RC is a great RC car for doing a lot with very little money. This 4WD vehicle is ready for just about anything. 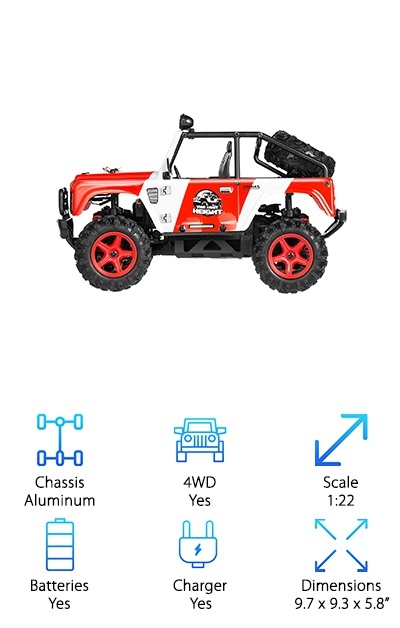 It can climb and ride over all sorts of terrain without missing a beat. The tires are semi-pneumatic, making them ideal for off road fun. The transmitter works at up to 100 meters. And this truck features an independent suspension, allowing the body more freedom of movement and giving it better shock absorption. Here’s the scoop; the ToyPark Off-Road RC is a favorite of ours in any category, but it really shines when you begin to compare the prices between it and many of the other models! We really love it, and we’re pretty sure you will too! The DeeXop RC Truck is a sleek-looking, beautiful RC truck with a lot of cool features. This thing has a large motor (one of the largest in its class) and is incredibly sturdy. It is completely waterproof, making for racing fun even in the rain! The traction on this thing is also incredible, necessary for play in any weather. The charge on the battery lasts for about 10-15 minutes, but it recharges in less than two hours. The transmitter stays connected at up to 100 meters, giving you the space you need for all of those sweet tricks and fun races. But that isn’t even the coolest part. No, the best part is that this thing can go speeds of more than 30 miles per hour! And with speed and style like this, what more do you need? Want a car that requires no assembly? The Dromida Brushless RTR Buggy comes ready to rock from the factory. It’s fully equipped for big speeds and crazy moves right out of the box; it doesn’t need any additional equipment to be powerful and super fun! This high-performance machine has the stability to keep going even when the going gets tough. It’s got 4WD, is waterproof, and quality tires to help ensure great moves even on rough terrain. The body is finished in the factory, fitted with a brushless motor built for high speeds. And that isn’t even the best part! This truck can be tailored to your skill level; the steering and throttle responses are customizable for you. This fierce little machine is a lot of fun, and we’re pretty sure you’re also going to love it! 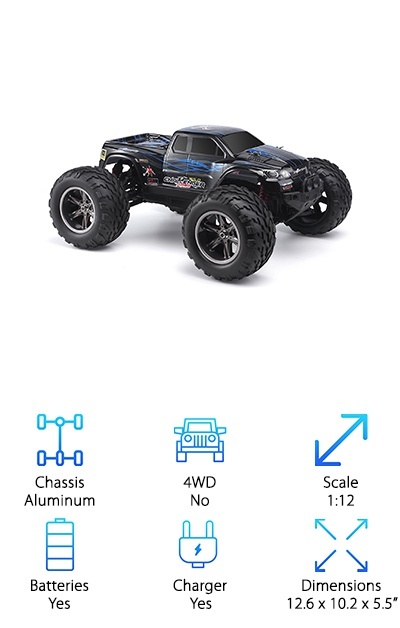 The Novcolxya 4WD RC is described as “indoor safe and outdoor ready!” This truck is built to last with a hard-to-break undercarriage and a protective, splash proof film over the whole body. It has 4WD with an independent suspension, making it ready for just about any terrain. This includes carpet, grass, puddles, open roads, mud, and tile. And it is also scuff-proof; this vehicle is designed not to leave marks on indoor walls and furniture, even if you run into them with it. It has a powerful motor that can drive the truck up to 25 miles per hour. 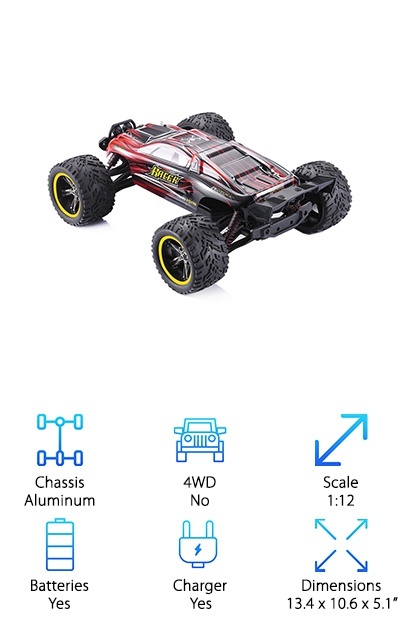 The Novcolxya 4WD RC is powered by a rechargeable battery (charged with a USB cable) while the transmitter is powered by AA batteries. And the coolest part of this RC truck is that the LED headlights and roof lights really work! This truck looks cooler than any other RC truck we’ve ever seen! The Rabing 2WD RC Truck is a powerful RC truck with a brushed, 390 motor. It’s a massive motor that lends massive power to the truck, giving it a top speed of 25 miles per hour. It features 2WD instead of 4WD, but it is still great for all-terrain driving. This thing is completely waterproof and has a very sturdy design to keep even the craziest of tricks from affecting its performance. It has awesome handling, giving you better control even at top speeds. It has a rechargeable battery inside of the vehicle that lasts for about 15 minutes for every charge (it takes about two hours to fill back up). The remote works at up to an amazing 100 meters, giving you the range the control you need for an awesome RC experience. Wanna go even faster? The GPTOYS Hobby Truck has a top speed of 33 miles per hour, making it the fastest truck on this list. The 390 brush motor is massive and powerful. The suspension is an S-truck design, giving it excellent off-road performance. Even without 4WD, this thing can run off of the road onto just about any kind of terrain without an issue. It is waterproof up to IPX5 standards, making rain, snow, puddles, and even some mud okay for racing through. The battery lasts for about 12 minutes, and it takes about 150 minutes to recharge, but lucky for us, extra batteries are easy to come by and relatively inexpensive. The remote is also very responsive and works out to about 80 meters. But our favorite part was that more than one of these trucks can be raced at the same time without getting any interference from the other trucks’ transmitters. The HOSIM Offroad Truck has a top speed of 23 miles per hour. This RC truck is about 1:12 scale, making it a little bigger than some of the others on this list. It comes with a lithium ion battery (with a 10-12 minute play time) that is rechargeable for the vehicle while the transmitter takes AA batteries to stay charged. The HOSIM Offroad Truck has a one-year warranty that protects your purchase and makes sure you’ll have a ton of RC fun ahead of you. This model has a powerful, 390-brush motor. But our favorite part of this truck is how responsive the steering is. 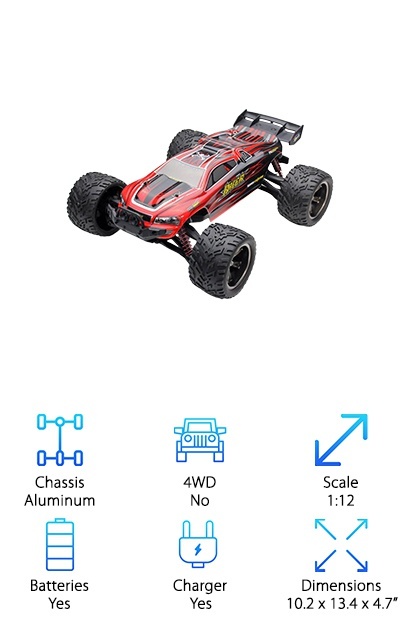 It feels like you’re really part of the action with easy transmitter action and powerful feel of this amazing RC truck. Looking for a sweet buggy truck? This GMAXT 4WD RC truggy is a powerful, speedy little vehicle that is ready for adventure. This truck can go up to 25 miles per hour. And even at top speed, this thing has a highly responsive transmitter; the steering and throttle are ready for your command! This model of truggy has a much longer battery span than most; it can run up to 30 minutes on one charge. It has a beefy suspension, 4WD, has rubber wheels, and is semi-waterproof, making it ideal for the outdoors no matter the weather. The GMAXT 4WD RC also features a one-year warranty to help protect your purchase. 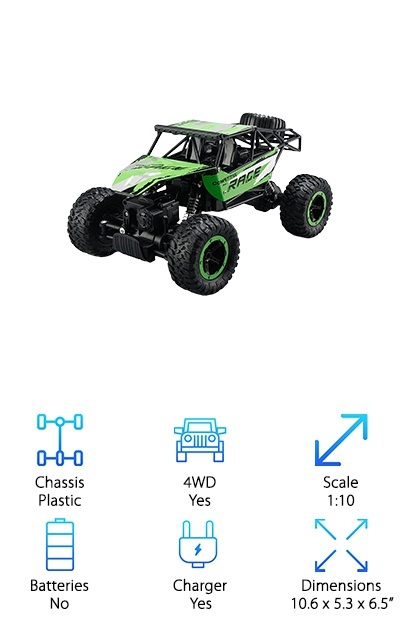 So if you’re looking for a real performance truggy, you can’t go wrong with the GMAXT 4WD RC. It’s a great RC vehicle that we think you’ll love! The ABASK Off-Road RC is an off-road dream! It has a shock absorption system and rubber wheels to help it cover all sorts of ground. It has 4WD and a very powerful motor, reaching speeds of 25 miles per hour. The ABASK Off-Road RC has lights, a spare tire, and is built for tricks and speed. At 1:22 scale, it’s a little smaller than some of the other trucks on this list, but it more than makes up for it in sheer speed and form. It has a three-stage differential gear, and the transmitter features a range of 260 feet. 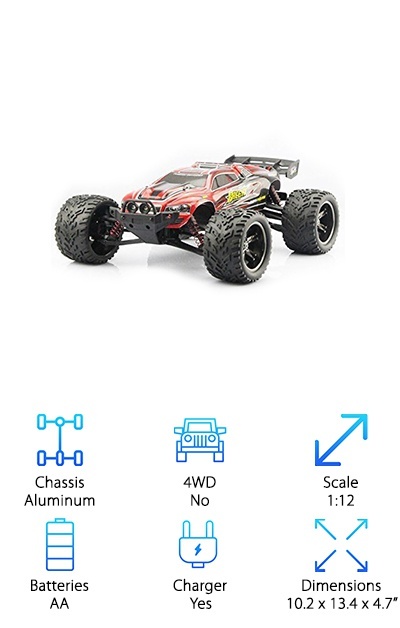 If you’re looking for a highly responsive RC car, this one is difficult to beat. Not to mention the battery lasts for a whole 30 minutes, which is more than most. It recharges in as little as 150 minutes as well.